Double glazed door to ENTRANCE HALLWAY Carpet as laid, storage cupboard, stairs to first floor, radiator. 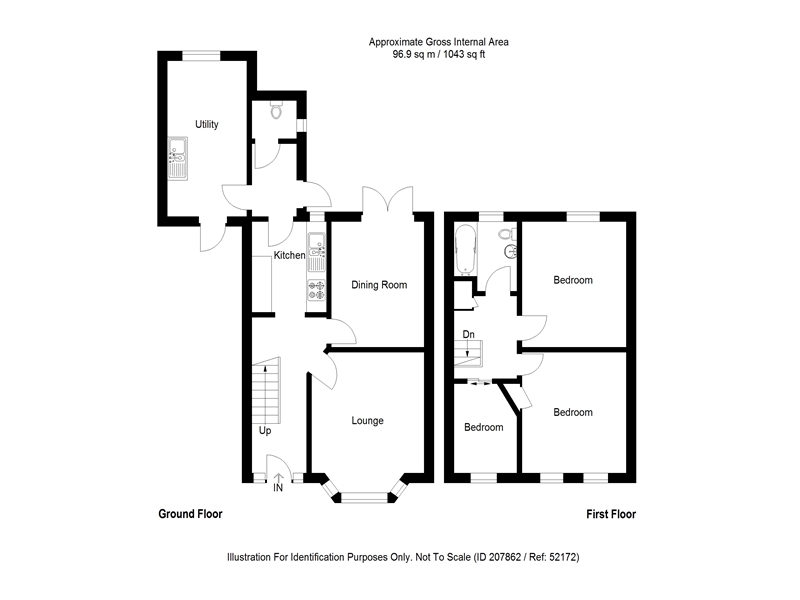 LOUNGE 14’11 x 11’10 (4.55m x 3.61m) Double glazed bay window to front, carpet as laid, feature fire place, radiator x2. DINING ROOM 12’7 x 10’7 (3.84m x 3.23m) Double glazed double door to rear, original flooring, radiator. KITCHEN 9’7 x 6’4 (2.92m x 1.93m) Double glazed window to rear, range of wall and base units with under lighting, stainless steel oven and hob, stainless steel sink with mixer tap, space and plumbing for dishwasher, vinyl flooring, radiator. REAR LOBBY Door to garden, vinyl flooring. DOWNSTAIRS CLOAKROOM Double glazed window to side, low level WC, carpet as laid. UTILITY ROOM 15’4 x 8’0 (4.68m x 2.44m) Space and plumbing for washing machine, stainless steel sink with mixer tap with cupboard under. FIRST FLOOR LANDING Carpet as laid, airing cupboard, access to loft. BEDROOM ONE 12’7 x 10’4 (3.84m x 3.15m) Double glazed window to rear, carpet as laid, radiator. BEDROOM TWO 12’0 x 9’02 3.66m x 2.79m) Double glazed window to front x2, carpet as laid, radiator. BEDROOM THREE 8’8 x 7’11 (2.64m x 2.41m) Double glazed window to front, carpet as laid, radiator. BATHROOM Double glazed window to rear, bath with shower over, low level WC, wash hand basin, laminate flooring, tiled walls, radiator. LOFT 17’0 x 15’1 (5.18m x 4.6m) Boarded, with light. GARDEN Patio, outside tap and light, laid to lawn, mature flower beds. Off road parking for two cars to the side. FOR A FREE VALUATION PLEASE CALL 01634 855000 6 DAYS A WEEK DISCLAIMER Whilst every effort is made to ensure the accuracy of these details it must be noted that all measurements are approximate only. Items shown in photographs are not included in the sale of the property unless specifically mentioned within the sales particulars. However they may be available by separate negotiation. Any reference to the tenure of a property is based on information given by the vendor but must be verified by a solicitor. Buyers must check the availability of any property and make an appointment before a journey to view to see a property.